Earlier this year, Swimming Times caught up with London-based swimming club, Positive Strokes. As the world marks the 30th World AIDS Day, we look back at how the ‘first openly HIV positive swimming group in the world’ began. When five men and their female coach headed for the 2015 EuroGames in Sweden, they were not only making history but striking a blow against the stigma that still lingers around HIV. The club name on the team’s bright red T-shirts said it all: Positive Strokes. And it attracted a lot of attention at the LGBT event. Yet despite this, there is still some stigma and myths relating to HIV and swimming. Positive Strokes founder member, Simon Randerson, is keen to do all he can to dispel these myths. “Despite lots of education over the past 30 years, many people are still unaware of how HIV is transmitted,” said the 60-year-old, who won a bronze medal in the 100m backstroke at the 2015 EuroGames. Public Health England states that ‘since the beginning of the epidemic [in the 1980s] there have been no cases of HIV transmission acquired through swimming.’ The health agency also emphasises that HIV is no longer considered a fatal infection, but a ‘lifelong chronic manageable condition’. Positive Strokes – winner of the David Sparkes OBE Innovation Award at the 2017 Swim England Awards – was born out of Positive Health, an exercise referral programme launched 20 years ago at the Central London YMCA. 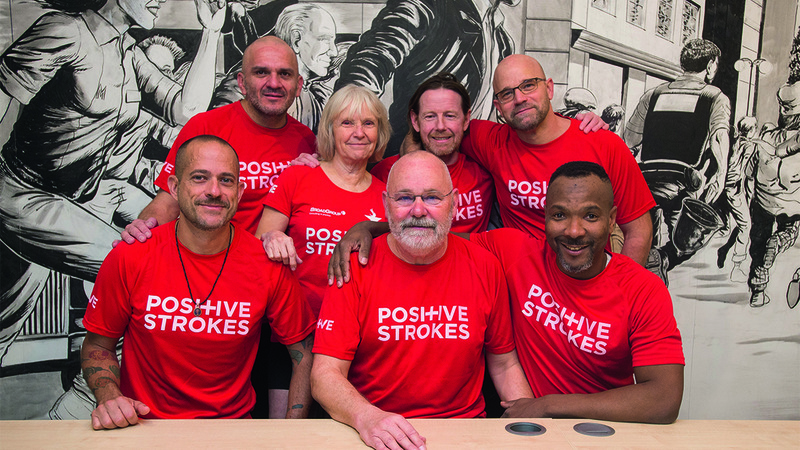 The 2015 EuroGames provided the impetus for the launch of Positive Strokes as a distinct swimming entity within the wider Positive Health set-up. “Apparently, in 2014 something like 19 per cent of people thought HIV could be transmitted in a swimming pool. To be honest, I thought it would be much higher, but 19 per cent is still too many”, said Simon. “When the five of us decided to go to Stockholm to compete at the EuroGames, we said ‘why don’t we swim as openly positive?’. We wanted to help end the stigma and show who we are. For Neville Fleming, the 2015 EuroGames also proved to be a defining moment. “When we showed up in Stockholm wearing those T-shirts, it was like coming out again,” said the 50-year-old, who is also one of the five founder members of the group, alongside Simon, Marc Tonti, Pablo Davila-Jijon and Darcy Lovel. Swimmer and teacher Marc, 49, says joining Positive Strokes has been ‘liberating’. He was diagnosed as HIV positive in 2000 but kept it a secret from most of his associates for several years. All that changed after he joined the Positive Health programme. “I very quickly joined the swimming club – I much prefer being in the pool than in the gym. Simon stresses the physical and psychological benefits of Positive Health and Positive Strokes. “Exercise is beneficial in many ways and having goals certainly helps people’s self-esteem. “When you get a positive diagnosis, your self-esteem can get obliterated and it takes a long time for people to build it back. Click here for more information about Positive Strokes.